As for legal scholars, a number of experts of international have long argued that Israel does not occupy the Gaza Strip. Northwestern University Law School professor Eugene Kontorovich, for example, makes clear (here and here) he disagrees with the view that Gaza is occupied. In the Cardozo Journal of International and Comparative Law (winter 2011), Solon Solomon states that although Gaza has a sui generis status which requires attention, “post-disengagement Gaza should not be considered ‘occupied’ by Israel” and “it is neither occupied nor under effective Israeli control.” Professors Yuval Shany, Ruth Lapidoth, Eyal Benvenisti and Avi Bell state that Gaza is not occupied, as do Elizabeth Samson, Benjamin Rubin, and Justus Reid Weiner. Good afternoon. I’m here with my colleague and good friend, Jim Wolfensohn, who has served as the special envoy for the Quartet on matters initially of Gaza disengagement in the Middle East. When Jim had really not even yet stepped down as the president of the World Bank, we asked him to take on a new task rather than going to play the cello immediately, and that new task was to assist the Palestinians and the Israelis in a coordinated withdrawal of Israeli military forces and settlers from Gaza. That has taken place and taken place successfully, despite all of the difficulty that was associated with it. And in fact, the Israelis do not any longer occupy Gaza; it is Palestinian territory. And that is in no small part thanks to the tireless efforts of Jim Wolfensohn, who worked day and night to make certain that that could happen. (Emphasis added). 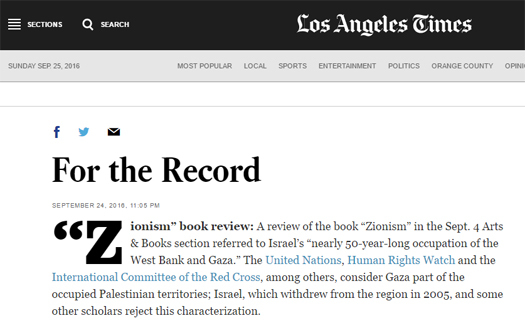 CAMERA commends The Los Angeles Times for the correction. While the correction was published online yesterday and in print today, the original online article is not yet corrected. For additional Los Angeles Times corrections elicited by CAMERA, please see here.